“IT may seem paradoxical, but I have learned almost as much from teaching others as I have from studying with others. There is nothing like making one’s mind alert by taking the responsibility of seeing that others play correctly and artistically. It is my firm belief that every teacher should play. He should be able to do more than play,—he should regulate his style to the pupil’s performance. Nicholas Rubinstein was a past master at this. In fact, I could learn far more from Nicholas Rubinstein and his playing than I might from that of his great brother, Anton Rubinstein. Why? The reason is a simple one. When Anton played, his performance was so astonishing and so overpowering that the pupil became discouraged. He was inclined to throw his hands in his lap and say: “What is the use of my trying? I can never play like that I may as well give up at once.” But when Nicholas Rubinstein played, he gauged his playing so that it was only a little ahead of that of the pupil. The pupil then thought, “Well, I can perhaps play as well as that with a little practice.” The mother when teaching a child to walk, does not run ahead as though in a race. She walks slowly and carefully. Many teachers seem to think that they must amaze their pupils by playing in a very bombastic and showy style. That is never the best for the pupil. As I look back upon some of the lessons I had from Anton Rubinstein, they seem like a nightmare even now. I felt that he was absolutely indifferent to what I played or how I played. There was naturally no question of enjoyment for him or for me. He did not actually teach me anything. He only gave a superinspired rendering of the music, and if the desire to learn was not killed in me it was due to my happy disposition which allowed me to regard these lessons as a temporary evil. Zverieff, my earlier teacher, who was a real pedagogue, felt the same way about them; after each lesson he talked to me in a peculiar way, as if he were making excuses for having made me study under such a master. The Russian conservatory system provides for distinct staffs of the elementary and for the advanced departments. Because a man like Zverieff devoted his life to the training of the young did not rob him of any honor or any distinction in the faculty of the conservatory. Nor was such a man expected to have had any less severe general musical training than the teacher of the advanced classes. He was simply one of the professors who had elected to make a specialty of training the pupils in the lower grades—a very important work, and one bringing him renown as a specialist. No one would dream of sending a beginner to other than such a specialist. It is a great mistake to place elementary pupils under the tuition of some famous virtuoso who, as a rule, is not adapted to teaching youngsters. It is like bringing some delicate plant out under the hot rays of a dazzling sun only to be shriveled up in an hour or so. When I say that I have learned by teaching, I mean that I discovered there were a great many effects in my own playing that I did instinctively and did not understand. For instance, I would play a passage for a pupil and prescribe a certain type of pedaling. The pupil would repeat, apparently going through the same mechanical process, and yet it would not be the same. Then I would have to analyze my own playing to find out the secret. This has helped me time and again in my public performances. The best performer and the best player must learn to analyze his own playing. One of the first things that the student discovers in advanced playing is that there is no royal road to learning in music or in anything else. It is for this reason that the principal thing in all good art is the mental picture,the conception, the ideal. The reason why many students do not succeed is not that they do not work, but that they have no proper picture of what they aspire to do. They play, play, play at the keyboard, but they never think and dream away from the keyboard what their interpretation should sound like. How does one get playing ideals? First by hearing as much good playing as possible and then through the development of the musical imagination. Your playing will never be any better than your playing ideal. Let us suppose that you were going to build a great temple. Unless your imagination permits you to see that temple in all its gorgeousness you will not be able to take the first step, no matter how great may be your technical skill. In pianoforte playing and in pianoforte study there are too many bricklayers and too few architects with vision. On the other hand, Leschetizky apparently took an opposite view, (judging from the playing of many of his disciples.) He seemed to feel that the seat should be low producing an angle of the hand and arm tending in this direction. Who can say which is right? No greater pianist than Liszt ever lived and he produced his results by his own manner of playing. The Leschetizky pupils play marvelously, so apparently the mere position of the hands and arm does not make such a radical difference in either case. What does make a difference with the individual pianist is the playing ideal,—the mental conception of the work whether it be program, music or pure music. The best teacher for the student is the one who can bring the most from that student. Fame means nothing. Take the case of Tchaikowsky. With a good student, he was a most excellent teacher, taking great pains to help him, but if Tchaikowsky was not interested, he was not only indifferent to the student’s progress but he would scold frightfully, Scolding never makes a good teacher. It is rarely necessary. It upsets the pupil’s state of mind and unfits him to do his best. When I studied with Tchaikowsky, he never neglected the details of the pedagogical side of his work although he did not like teaching. He corrected all the harmony exercises with care and minute precision. The pupil often does well when he has a teacher of opposite temperament. The effervescent pupil needs the hard training that a serious minded, patient master can give, while the sluggish pupil benefits from having a brilliant alert teacher always ready to spur him on. 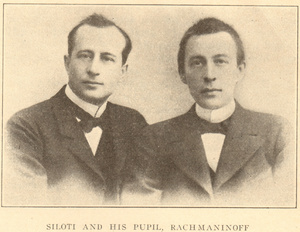 When I was teaching my cousin Rachmaninoff, he already manifested some of the sombre, almost pessimistic traits which marked his early career. On the other hand, I was an optimist. To me it was always the gold of morning sunshine—to him it was the black of midnight. While teachers should be able to play and play finely, they should remember that the duty of the teacher is to teach, not to turn each lesson into a pianoforte recital. It was only occasionally that Liszt played a whole piece through for us. The usual thing was for him to sit down and show us a single passage, but even that he only did for some of his pupils—the eight or ten out of the thirty or forty present who actually played. The residue was made up, for the greater part, of English and American women in great variety, who merely formed an audience. This did not prevent them, however, from calling themselves Liszt’s “favorite” pupils,— apparently he had none but “favorite” pupils. In My Memories of Liszt I have endeavored to give a picture of Liszt as a conductor. He was not in any sense an ordinary conductor. Whether it was at Weimar or further afield, the orchestra had first to study the things that they were going to play with their own conductor until they knew them almost by heart. The conductors were also near at hand to help the orchestra or chorus on dangerous moments while Liszt was conducting, such moments being not infrequent, for the greater part of the time Liszt could not be said to conduct at all. His appearance at the conductor’s desk was imposing. His long tightly buttoned abbe’s cassock, his bushy mane of white hair, and his air of spirituality, all combined to give him an unearthly appearance as of being from another world. Not only did he look gigantic but he seemed to be soaring above us all—above the hail itself. He used no baton. In the soft parts he would beat time almost imperceptibly or not at all. When he came to a big crescendo he would suddenly spread out his long arms like an eagle spreading his wings, and the effect was so morally uplifting that you felt impelled to rise from your seat. 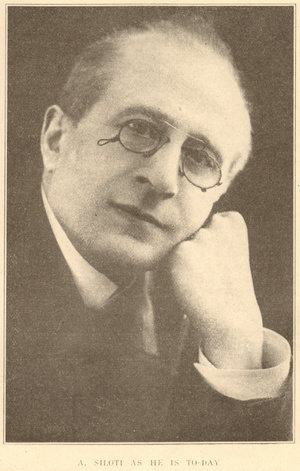 You are reading Many Roads to Artistic Playing: Alexander Siloti from the March, 1923 issue of The Etude Magazine. Alexander Siloti - Leaves From a Virtuoso's Note Book is the next entry in The Etude.